Now you are wondering if it is a “Smart Meter” or not. Please Review the following two meters very carefully so you can be certain which kind you have. Note : This one has a FCC sticker, the one above it (C1S) does not have a FCC sticker. 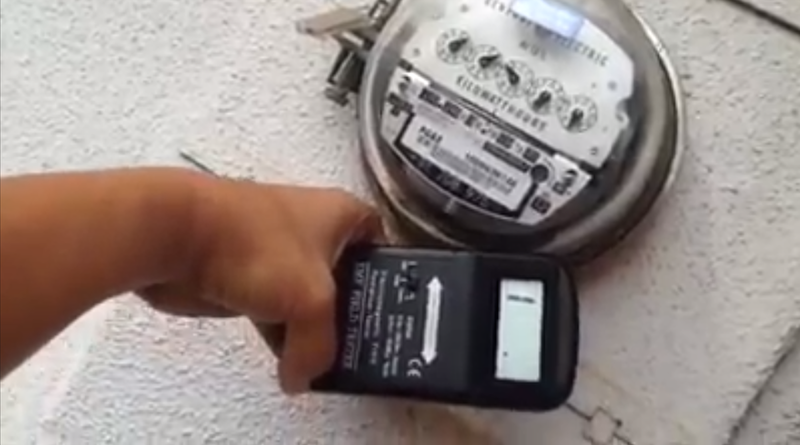 EIwellspring.org: “There are meters available which transmit by wireless or by PLC [power line carrier], which both can cause health problems.” Here is a link that includes pictures, revealing what an analog electric meter with a wireless transmitter in it looks like: http://www.eiwellspring.org/smartmeter/StealthMeters.htm. Similarity of meters is confusing, now everybody should be able to find out whether a smart meter has been installed already or not. Very helpful, simple info, thank you. I have the first one and will be noticing SaskPower, here in Weyburn, that they are not to install the second one – ever! On the Itron site it talks about personality module upgrades of the C1S. Not sure if this is done remotely or not. A smart meter was installed without our permission. I complained loudly, received a phone call that nothing could be done. 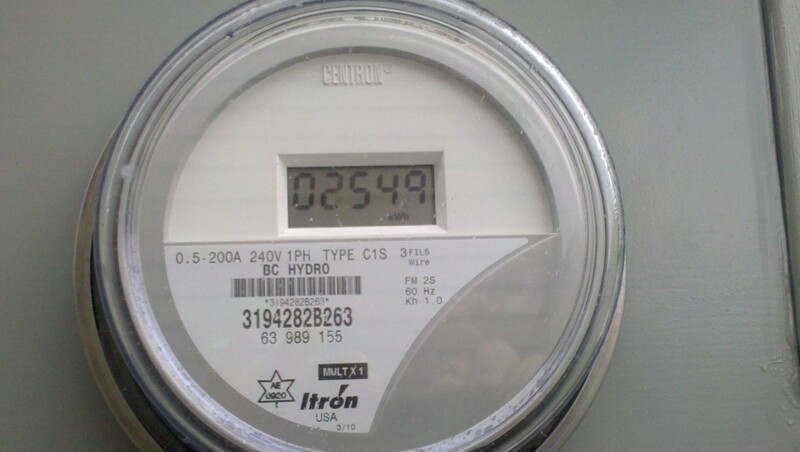 While we were on vacation, BC Hydro came and replaced it with the “digital” meter above. I had no idea whether this was an improvement or not. Thanks so much. I think it’s a good thing – and have no idea why they did it. We have the first type of meter & I will be sure to let our power company know that we refuse to have the second type installed. I have heard nothing but complaints about misreads & way above average readings. Thanks again. OH Look! Page 33 It says 4 watts. That is 8 times more powerful than a cell phone. It is a good thing I do not have a pacemaker. Oh yeah Where is the warning label on the meter? Did you want the warning label on a BC Hydro Smart meter? Well here it is===>https://fjallfoss.fcc.gov/oetcf/eas/reports/ViewExhibitReport.cfm?mode=Exhibits&RequestTimeout=500&calledFromFrame=N&application_id=278106&fcc_id=%27SK9AMI7%27 Pick the fourth item. The RF exposure. What a great warning label. I live in Kootenays and have had the first type installed, however, I am 100 percent sure it is the smart kind as it comunicates with utility company every hour on hour and it has literaly dissabled my use of wireless phone during those times. Sometime for 3 to 4 minutes at the time. Lately it has cut off my wireless internet right off for duration of 3 minutes. I believe that the antena IS installed under the blank plastic face, as an unadvertised upgrade…. If the power company could control your power usage such as shut off your power with the meter-that would be troublesome. Otherwise who cares if someone knows how much power you use? The CENTRON® meter accepts an array of flexible communication modules that adapt as your needs expand and change to meet all of your residential metering system needs. The interchangeable personality modules allow simple system expansion and easy upgrades. ANALOG MECHANICAL BRAND NEW METERS are easily purchased and can be registered with Measurement Canada as a legitimized replacement meter for a smart meter in a straightforward manner, simply by following the correct prior legal notification of “just cause” which is sent to BC Hydro prior to replacing a smart meter with a new registered analog meter. Check with freedomtaker.com for the Canadian legal package. There is a very real reason for hanging on to a mechanical analog meter or buying a certified CSA and UL approved analog meter to use to replace the non certified non CSA and non UL approved smart meter. It is strongly recommended that anyone who thinks they are “stuck” with a smart meter go to an electrical supply store and buy a replacement Canadian certified replacement analog/mechanical versus any DIGITAL electricity meter. Both pre-smart digital and smart digital meters are digital meters. Any AMR pre smart digital meter is designed to become a “smart” meter and can be physically upgraded to become a “smart” meter with the simple two minute addition of what Itron’s obfuscating language prefers to call “personality modules”. platform. Kilowatt-hours and tamper data are reported through RF transmissions. The R300 IDM module provides both baseline and advanced data collection functionality, including interval data recording and enhanced tamper reporting capability. The R300 IDM delivers the ERT Standard Consumption Message (SCM) to any of Itron’s radio-based data collection technologies, including handheld computers (OMR), a vehicle based mobile AMR unit such as the Mobile Collection System and Mobile Field Collector, or a network data collection solution such as the Itron Fixed Network or MicroNetwork. In addition, the R300 IDM is capable of delivering the Interval Data Message (IDM) to the Itron Fixed Network AMR system to calculate ANSI standard demand, time-of-use and load profiling information. 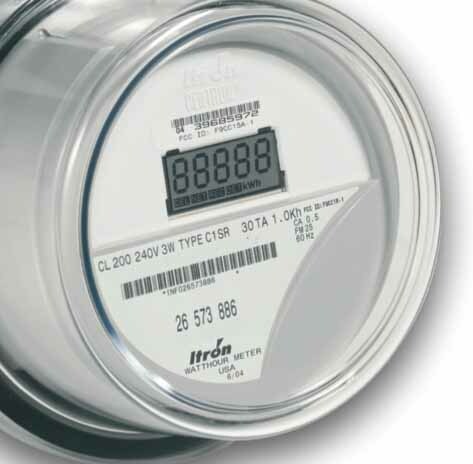 The meter can be reset by using the ZRO-C2A which resets both the kWh register and tamper status counters. upload and download of information to and from utility billing systems. CENTRON CN1S—The CENTRON CN1S solid-state meter is used to measure network energy consumption. It is available as an energy meter with an LCD, clock, or cyclometer register. As an option, the meter is available with interchangeable personality modules, including demand, time-of-use (TOU), load profile, and various communication options. CENTRON C1SD, C1ST, C1SL Multifunction Personality Meter Modules—The CENTRON C1SD, C1ST, C1SL meters include interchangeable personality modules that snap into the standard CENTRON meter metrology base. The three multifunction modules available include: demand module (C1SD), a Time-of-Use module with demand (C1ST), and a load profile module with TOU and demand (C1SL). CENTRON C1SC—The CellNet® Radio Frequency Personality Module adds one-way radio frequency (RF) capability to the CENTRON solid-state metering platform using CellNet data systems RF technology and protocol for fixed network applications. The C1SC operates in the unlicensed 902-928 MHz frequency range using spread spectrum technology. 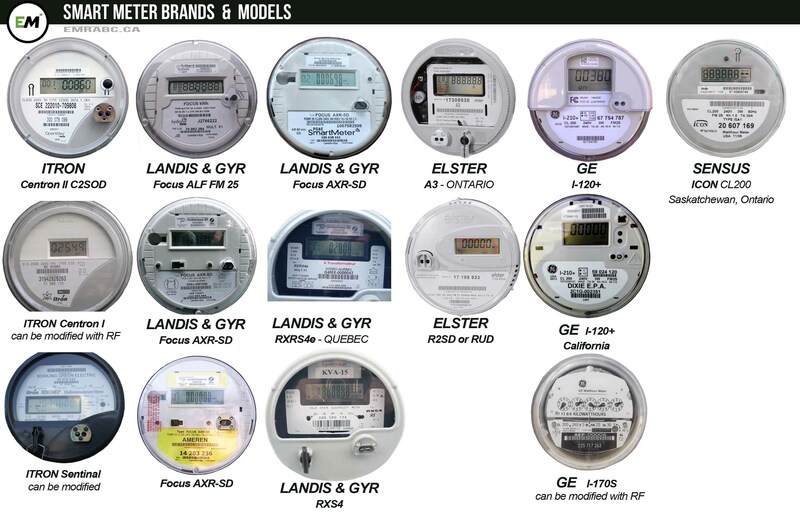 FYI For those of us IN THE UNITED STATES – the only certainty of identifying a smart meter comes from the inclusion of an “FCC ID” code number on the front of the meter. FCC mandates that if a piece of equipment has a transmitter, then it must have an FCC ID # to document its specifications. It can be in very small print. It is most often NOT the more centrally featured code that is in larger size font. I participated in the Maine Health Survey on Smart Meters – and even their instructions were difficult to follow because THERE ARE GREAT VARIATIONS in the placement of information on the face of the meters! MY SUGGESTION – (so that you don’t get blasted as you stand before the meter face) – have someone take a picture of the full face of your meter and then enlarge the picture so that you can search carefully for the words “FCC ID: (followed, at least at this time, with 7 characters – i.e., combo of letters and numbers)”. BONUS INFO: This is also the way I found out that my new TV, marked “no wireless” on the box, had a transmitter that bothered me immediately. Because there was “FCC ID…” on the back, we knew there was a transmitter somewhere. My Bau building consultants found the ID, searched with their meter to pinpoint the location and “disarm” the transmitter by putting a piece of shielding fabric over the back and front of that area of the TV. The first-line tech support person at LG had no idea what we were talking about; the supervisory tech person was able to identify that the transmitter sent info to the extra “apps remote” (not the turn-the-channel remote) that was additionally included with the TV. Be fore-warned: As equipment and appliances get more “smart” this type of situation will start becoming the default mode. I would like to know what the LEvEL codes mean. The meter that has been installed changes LEvEL codes. Does amyone know anything about theses codes ? I already have a digital meter. It is my understanding that this is not a smart meter. However, I have heard that this is emitting rf as well. How do I know if this cannot be converted to a radio on meter and how safe is it? Rockland Electric sneaked one on my house over a year ago which is designated C1SR, and looks like the top one on this page… Anyone have anything on it? The company claims it’s not wireless or “smart” but then again I’ve never seen any meter reader guy around the house in over a year either! In any case, my mother went mad from Alzheimer’s within the last year–and she sits in a kitchen chair that’s directly adjacent to this monster mounted on the outside of the house! The “R” suffix stands for Radio Frequency! The lying SOBs won’t even fess up to this!!! This box destroyed my elderly mother’s Mind. As a former Electronic Technician can no longer sit on the fence Post and read the nonsense by some people that seem to have an Agenda rather than finding the Truth about Smart Meters on the Internet. Being 73 and retired after spending 50 Years in various Electronic Industries one being CGE and Sylvania and the Submersible and Aircraft Industry ,I am most Familiar with RF ,Instrumentation and PLC’s.Likewise I am a licensed Radio Amateur. I repaired and designed RF related Circuitry, from the days of tubes to our recent technology. I know that there are many more qualified persons around that can offer their unbiased and technical supported Opinion, unlike Mr.Sielmann who has nothing to add but his theoretical biased opinion of things he read while likely being taught to think within the Box. If you Google smart Meters you will find the Studies of many Scientists Worldwide and Technical Bulletins that support the views and Statements of Mr.Karow and myself. Anyone can be anything on the Net or in the Paper (a M.Sc. does not cut the Mustard)if you do not have the Instrumentation to proof conclusively to yourself or others what Mr Karow and hundreds of other Scientists are Stating. Unless you do, your comments are simply hot air. I possess such Instrumentation and if challenged I can furnish proof thereof. Only recently they found that Microwaves in the frequency Range of Smart Meters do kill our Bees. 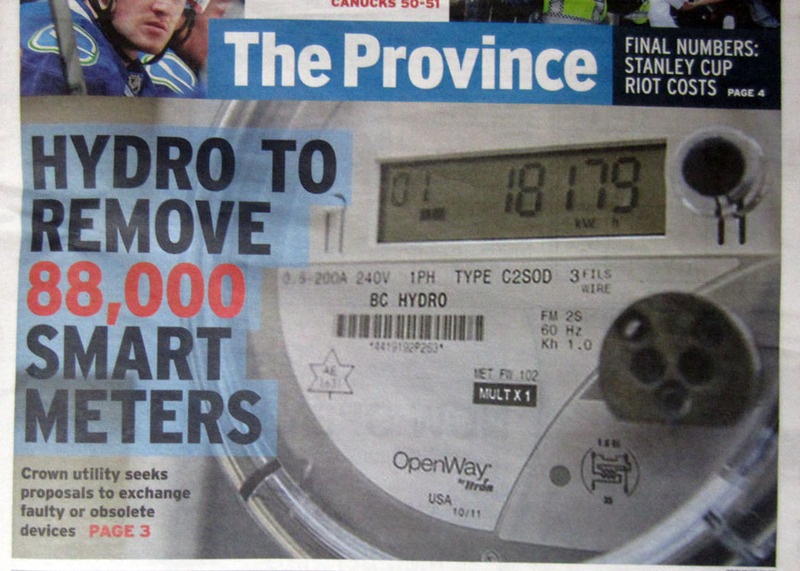 Not only other Governments but other Canadian Provinces banned and even removed Smart Meters, while B.C. is still installing them. 1000mw is a significant amount of Power and although it decays like UV Radiation it is still harmful to anyone that is near its vicinity, and you can not escape such Radiation, since every house has become a Transmitter and several more transmitting from an Apartment. I would not like to live in an Apartment complex near the Electrical Room that contains more than 1 Smart Meter, well you do the Math. Any form of Radiation whether Nuclear,or in the Spectrum of RF,light or in the Sonic Range can be Hazardous. Just ask the Military all is being Weaponized. It took a long time to finally recognize the danger of living near or under a High Voltage Transmission line. However the Health Issue due to RF or EMF Radiation is only a small part of the overall Problem. While we all are very familiar with filling up our Gas Tank and pay the Amount Displayed at the Pump we are assured by an independent Government Agency (Weights and Measures) that this Pump was calibrated and can not be manipulated by the company or the operator. While you can actually measure the amount of Gasoline you get you are unable do that with the Electricity that you have consumed, and even if you could who will listen to your dispute? The Smart Meter is a two way communicator with a programmable Microprocessor that can be reprogrammed by your Electric Company to read any thing that the provider deems it to be read remotely from their Office. Think about that for a moment, their Word that it is calibrated means therefore nothing at all. If the Smart Meter had only a one Way Communication to send the Amount of Usage to its provider to eliminate the Meter Reader, I would have less reasons to Object, after all that was its intended Purpose. There would also be a lesser chance for a Hacker to intercept, modify and or reprogram the Meter, eliminating some of the privacy issues. Again I can provide you with two dozen of Links from all around the World from Experts that have far greater knowledge than myself. Personally I prefer an Analogue Meter( with or without a Digital Readout) and since our Water is being read by a Meter Reader through a remote emitter on your House why can there not be one for our Hydro? Oh sorry, different Union different Folks, now since Kelowna sold their Power to Fortis,what a shame. I live in Virginia Beach, USA. I have become Electrosensitive in the last year. Started with fluorescent lights, now is cell phones, cell towers, wifi, other Wireless and recently has started with the Electric Meter attached to my house. I am getting sicker and my sympthoms more severe. It is a Schulmberger Centron, it does not have the black botton, has digital numbers, says watt hour at the bottom. I called the power company, Dominion power, VA, and they told me it is not a Smart Meter, just an Electric meter. It is giving me tachycardia and headaches when I am in my kitchen, not everyday, because my sensitivities change, but I have several attacks in one day. If is not a Smart meter, why am I getting sick? Dominion power said it transmits like text messages when they drive in the neighborhood, but I am definatelly getting more attacks tan those times. I have the same reactions to the ones from the neighboors that are the same. They said they can not change it for a different one. I am going to get an estimate from an electrician to get it relocated to a different place. I am so desperate. Anybody knows of these meters causing health problems? NB Power just installed a new meter on my house. I approached the installer with the question “Is this a smart meter?” and was told “No, it is just a digital meter”. Can you tell me if an Itron AE0920 is a smart meter? I live in Quispamsis, NB and NB Power just installed the C1SR meter on my house. 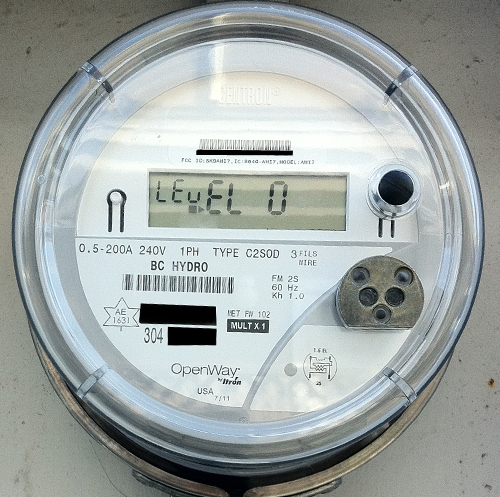 A smart meter is a very cheaply made surveillance and data extraction SCADA computerized device, a microwave operated commercial two way transmitter installed on private property with no siting permit, for the benefit of the power company and government. Everyone who has used one ought to remember just how glitchy and vulnerable and easily compromised computers are. So why demonize and fear it? It is easy to neutralize the pulses and surges emitted by a smart meter and this can be done legally. Use a smart meter suppressor. It will reduce ramped up “smart” power bills and this way you also get to take back your privacy and health. Have an electrician take 10 to 20 minutes to correctly install an industry grade sine wave tracking frequency attenuator device in your circuit box/service panel. It can share two 15 amp circuits. It is NOT an ordinary suppressor. and clamps down on them. This way it stops pulses and surges. The smart grid needs pulses and surges to operate. No pulses and no surges means no frequency graphing your daily habits, no over billing by using pulses and surges, and no sickness. One good brand is sine tamer, it is not cheap but is warranted for 25 years. They have saved industry money for decades. It is worth the cost, saves money and protects loved ones. While you are at it consider making a home made meter cage of uncoated aluminium insect screen to create a Faraday cage placed around the meter, so as to protect the ecosystem. Very simple, easily replaced with another, if they take it away. I am searching to buy an Analog Electric Meter that is revenue rated for use in Canada, which basically means that it is certified for billing purposes in Canada. Can anyone help direct me to a supplier? I’ve not had success finding one.